Week 11 is here and teams are turning up the heat in divisional races. Our last week with a full group of bye teams before the stretch run and Rob Trayah takes a look at a few games on the docket worthy of taking a closer look. We sit in the NFC for two games this week and look at the Titans/Colts matchup in Indy. Week 11 has six teams on a bye so the pickings are slim, but lines are moving this Sunday so get them while you can. Indianapolis Colts Tennessee Titans 4-1 6-2 48 -130 -2 48 -135 -2 48 -140 -2.5 48 -145 -2.5 48 -2.5 48 -130 -2.5 47.5 -126 -2.5 Colts -1.5: Stop me if you've heard this before: Andrew Luck hasn't lost to the Titans. These aren't your father's Titans, but these aren't your mother's Colts. 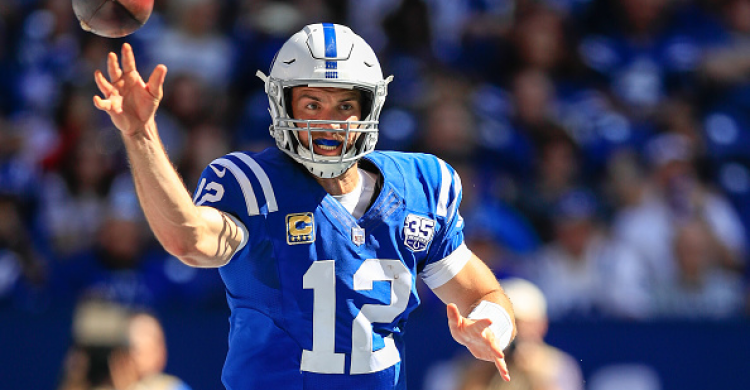 Frank Reich has taken this team with a healthy Luck to a 4-5 record three straight wins. Are they really good? No, but a home team with this low of a spread at home is worth it since they're also just two games out of a division lead. Tennessee travels to Indianapolis to round out a month of games that were in London, Dallas, and a home game against the Patriots. Teams get hyped to play New England and this screams let down week. Teams that have beaten the Pats have lost both weeks and both taken a turn for the worse (Jacksonville and Detroit). Overall in this series, the favorite is 9-2 in the last 11, which is good news for Indy. Arizona Cardinals Oakland Raiders 1-4 1-7 40.5 -210 -4 40.5 -185 -4 41 -180 -4 41 -190 -4 41 +4 40.5 -208 -4 40.5 -203 -4 Cardinals -6: There's not much to say about how bad Oakland is and where Jon Gruden is taking this team. Six points is a lot to lay with a bad team in Arizona, but the Raiders have nothing on either side of the ball. Oakland is 0-5 in its last five including 0-5 ATS, giving up more than 20 points in each loss. Arizona was able to cover last week against the Chiefs, limiting KC to 26 points while giving up a little over 300 yards of offense. The exciting news is that David Johnson is back, with Byron Leftwich calling plays, after getting 21 carries and seeing nine targets in the passing game, good for two touchdowns. Oakland has had limited practice time this week with the fires in California and there's no real hope left for this team. Pound Zona. Carolina Panthers Detroit Lions 1-4 2-6 51 -200 -4 51.5 -185 -4 51.5 -185 -3.5 51.5 -190 -3.5 51.5 -4 51 -200 -3.5 51.5 -191 -3.5 Over 49 Carolina/Detroit: Fresh off a bad loss to Pittsburgh, the Panthers travel to Detroit, losers of three straight, where both defenses are struggling. Carolina has hit the over in three straight and Detroit has given up 20+ points in six straight. Stafford no longer has Golden Tate and must rely on Kenny Golladay this week with Marvin Jones out. The focus will be on the running backs with Kerryon Johnson and Theo Reddick being highly productive in the passing game. Carolina's defense isn't what we thought it was giving up 21+ in three straight. Expect this game to be fast on the turf in Detroit and points to be aplenty.